'Dome Of Omar' OGB- ( William Hawkinson, R. 1972). Seedling AB/H 67-94. AB (1/2), 28" (71 cm). Early bloom. Standards smoky tan, eggplant splashes; Falls bamboo, onco-type eggplant veining. 'Grand Vizier' X ( 'Kalifa Baltis' x 'Blue Gate'). 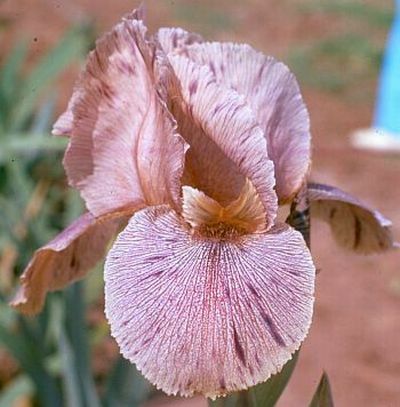 Sierra Vista Iris Gardens, 1973. Other references: AIS Bulletin #216, January 1975, page 11.